Retail traders continue to net-short positions for the S&P500 and the Dow Jones. Prices may soon reverse despite traders remaining net-short. Throughout the week, big banks will continue to release their first quarter earnings report. Goldman Sachs Group Inc. and Citigroup Inc. reported their earnings on Monday and investors were disappointed to find that estimates were not met, which resulted in Goldman’s share prices to decline by 3.2% and Citigroup shares to decline by 0.7%. As the week progresses, more reports will be released. Bank of America and Blackrock are scheduled to release their first quarter results on Tuesday followed by Morgan Stanley and US Bancorp on Wednesday. The current sentiment suggests that the price trend for both S&P 500 and Dow Jones may soon reverse, and this will be more evident as more reports are released throughout the week. Wall Street: Retail trader data shows 35.2% of traders are net-long with the ratio of traders short to long at 1.84 to 1. In fact, traders have remained net-short since Jan 04 when Wall Street traded near 23357.9; price has moved 12.9% higher since then. The number of traders net-long is 12.1% higher than yesterday and 40.1% higher from last week, while the number of traders net-short is 0.8% higher than yesterday and 0.8% higher from last week. We typically take a contrarian view to crowd sentiment, and the fact traders are net-short suggests Wall Street prices may continue to rise. Yet traders are less net-short than yesterday and compared with last week. Recent changes in sentiment warn that the current Wall Street price trend may soon reverse lower despite the fact traders remain net-short. US 500: Retail trader data shows 28.7% of traders are net-long with the ratio of traders short to long at 2.48 to 1. In fact, traders have remained net-short since Jan 07 when US 500 traded near 2414.79; price has moved 20.2% higher since then. 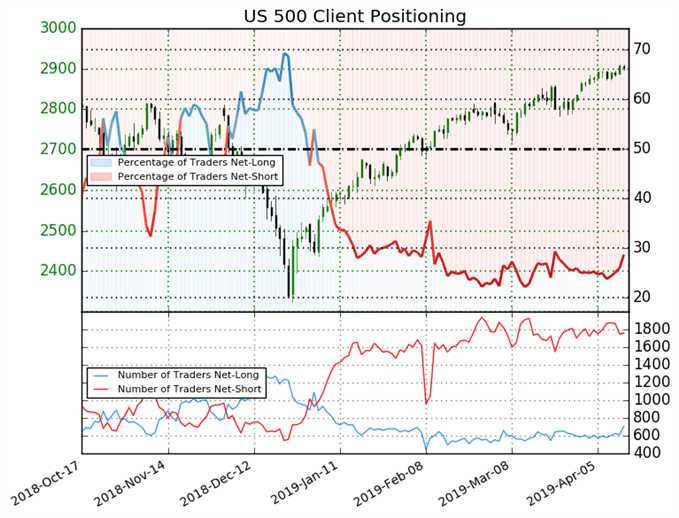 The percentage of traders net-long is now its highest since Mar 24 when US 500 traded near 2805.43. The number of traders net-long is 2.8% higher than yesterday and 15.3% higher from last week, while the number of traders net-short is 0.7% lower than yesterday and 1.5% lower from last week.